well, unfortunately after ripping this from the vinyl yesterday, i see that this has been posted in a few other places too, mutant sounds and WFMU’s site. but oh well, we try and bring you stuff that is isn’t out there in droves, and i think this still fits the bill even though it has been covered by two great sites. I feel that these are the standout tracks for us in this freak-out from ’68. audio collage, satire, politics, choruses, and fuzz all make into this mash-up trip out. J Marks and Shipen Lebzelter created this in era of free experimentation, an era when Cage and Stockhausen were part of the public consciousness, as well as Hendrix, Hair, and psychedelia. 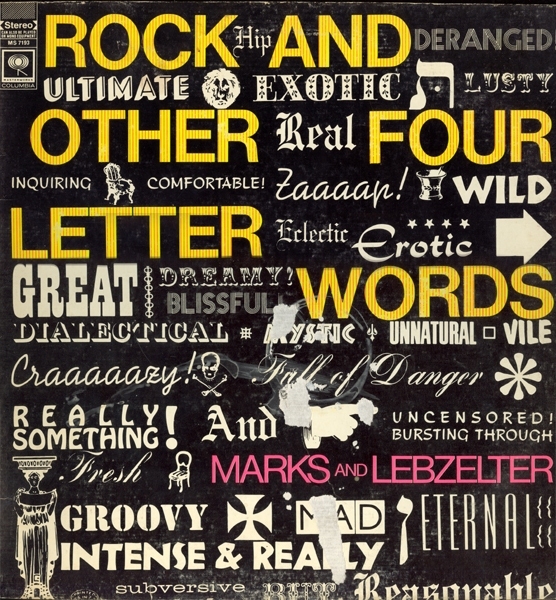 Lebzelter later went on to form a psychedelic Christian consciousness community in NYC called the Trees Community in the 70’s and put out a few more records. It also reminds of records like White Noise, and other studio collage rock, although the choral groups gives it a bit of that Hair feel too. It was put out at the same time as a an essay book called Rock and Other Four Letter Words: Music of the Electric Generation with photos by Linda Eastman, who became shortly after that, Linda McCartney of Wings fame. Yeah ! I remember this album VERY WELL ! I was 18 years old, droping acid and emerging from the MOD scene into the Hippie generation. Iam telling you – I thought I’d never see or hear this again – WOW ! ! we’re glad you dig it! and thanks for the story, thats amazing. it seems appropriate behavior whilst listening to that record. hell, you could even leave out the acid and still get tripped out by that record!